Lara, and especially Holly are both mahooooosive Minions fans and they were both eagerly awaiting the release of the new Minions movie on Blu-Ray, DVD and 3D having enjoyed it an awful lot at the cinema earlier this year. In the movie, minion friends Kevin, Stuart and Bob search the world for a new master for the minions who are only ever truely happy with a master to follow. 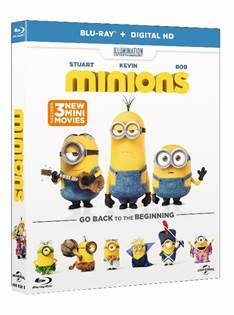 The movie is packed full of minion madness and the girls giggle a lot when they listen to the minions talk in their own special language. To celebrate the release of the Minions movie, the girls were tasked with the creation of their own very special minion baubles. The girls had great fun painting ceramic baubles with yellow paint (I'm not sure my dining room table had so much fun). Lara and I painted faces onto the baubles and then I let the girls loose on their minions with a selection of christmassy craft materials to see what they could come up with. The girls chose to decorate their minions with sparkly pen - one of them is sporting a beautiful blue sparkly set of denim dungarees. There is also a lot of festive bling going on. This one has a three-tiered Santa hat! One of them is even wearing Holly leaves!